Most mercury is obtained from cinnabar, a naturally occurring red sulphide (HgS), by roasting in air to vaporize and then condense the mercury. This may be demonstrated by mounting a 1″ by 10″ or 12″ hard-glass tube as shown in the photo on the facing page. Place powdered cinnabar or mercuric sulphide in the center, and keep it in place with a loose plug of asbestos or glass wool on each side. Connect one end of the tube to an outlet tube in the stopper of a gallon bottle that is also connected to a water supply. Plug the other end with a stopper fitted with a bent glass tube. Insert this bent tube in a tumbler of water containing several drops of sulphuric acid and enough potassium permanganate to color it a pale violet. After making sure all connections are tight, heat the center of the tube strongly. Then allow a small stream of water to run into the bottle. This forces a slow current of air through the roasting tube, causing the generated gases to bubble up in the tumbler. The solution will lose color slowly, revealing that one of the decomposition products of heated mercuric sulphide is sulphur dioxide. The other, metallic mercury, condenses in tiny globules in the cooler parts of the roasting tube. Metallic mercury is not poisonous, but its vapor is quite poisonous. Mercury therefore should never be heated in an open vessel. All soluble mercury salts are also poisonous, and they should be handled with care. Keep them away from your mouth and food, clean up immediately any you spill, and wash your hands thoroughly after handling them. Familiar compounds are insoluble mer-curous chloride, or calomelâ€”used largely as a purgativeâ€”and its deadly companion, mercuric chloride, better known as corrosive sublimate or bichloride of mercury. Despite its potential deadliness, mercuric chloride is also a powerful antiseptic. Because light can decompose calomel into dangerous corrosive sublimate, this medicine is kept in dark bottles. The white of an egg, mixed with a little water and administered quickly, is one of the best first-aid antidotes for mercury poisoning. Mercury salts precipitate albumin, forming a bland, insoluble substance that takes the remaining salt “out of circulation.” To demonstrate the reaction in a test tube, pour diluted egg white into a solution of mercuric chloride or nitrate. A hard, insoluble precipitate will form and remove the mercury from solution. Mercury has the strange property of uniting directly with most metals and a number of other elements to form compounds and alloys. Grind metallic mercury with powdered sulphur, and the substances unite as black mercuric sulphide. Iodine crystals ground with mercury produce red mercuric iodide. An alloy of mercury and another metal is called an “amalgam.” The “silver penny” that boys make by rubbing mercury on a clean copper cent is the result of amalgamation. Zinc rods of wet primary batteries are coated with mercury to provide an alloy surface that acts as if it were pure zinc. Plastic amalgams of mercury and silver or gold are used as dental fillings, their plasticity controlled by the amount of mercury. 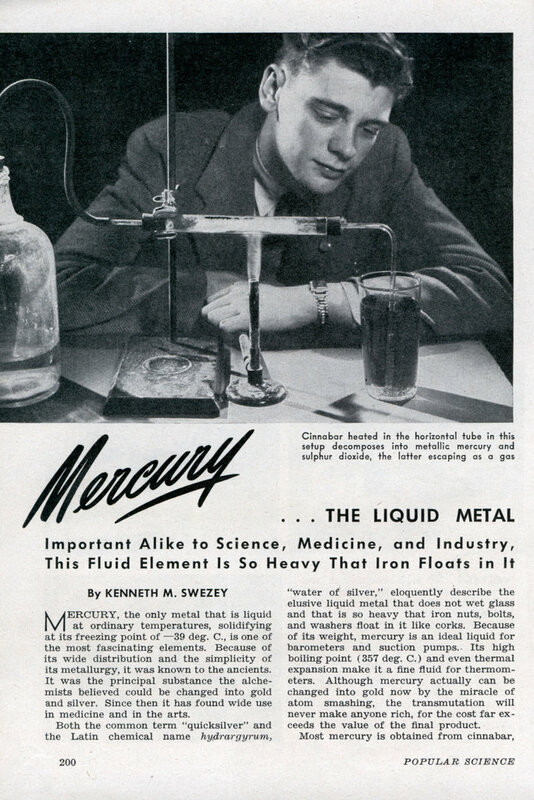 Surfaces of metal objects may be amalgamated with mercury also by dipping them into a solution of a mercury salt. Because mercury will unite directly with every ordinary metal but iron and platinum, those working with it must be careful not to let it touch their gold or silver rings or other jewelry. If a metal article can be heated safely, however, the mercury can be driven off by heating it carefully over a medium-low flame. hue. The white precipitate that settles to the bottom should be washed by de-cantation. Pour off the clear upper solution, add fresh water, shake, allow it to settle, and again pour off. Repeat these steps several times. The remaining precipitate is spread on glass to dry without heat. Work the dry powder into a stiff paste by adding a little water containing a few drops of mucilage and a few grains of potassium nitrate. Then mold the paste into little conical pellets and let them dry thoroughly.